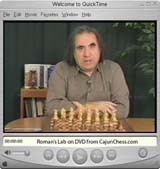 In Volume #30, Roman will teach you how to master the endgame. GM Dzindzichashvili discusses endgames with material imbalances including: defense based on fortresses in positions with Q v 2 minor pieces; Q (+ P) v R(+P); endgames with the advantage of the Exchange; bishops of opposite color endgames; B v N endgames; N v Ps; R v Ps. GM Dzindzichashvili examines tactical solutions (including decoy, stalemate, perpetual mate threats) in certain endgames of type R v P and R v Ps; bishops ofopposite color endings; N + P v B; pawn endings; and R + B v R.